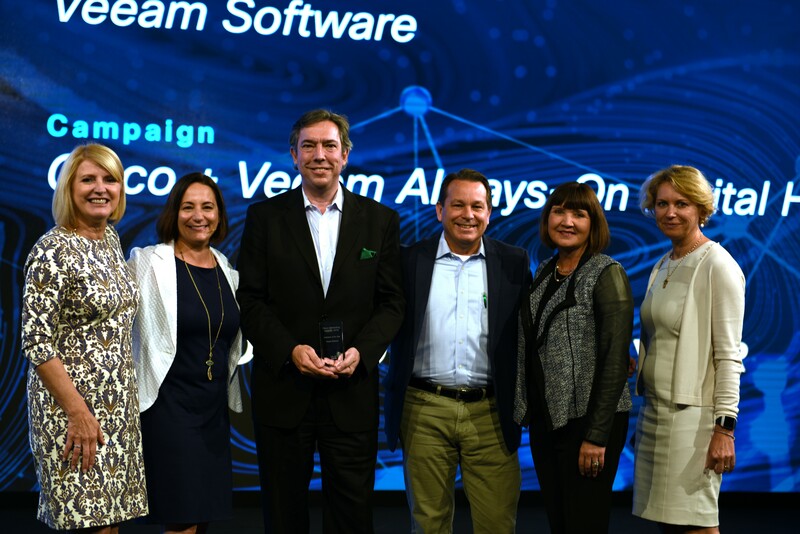 At Cisco’s annual marketing conference in Barcelona, Spain, Veeam was recognized with the Marketing Velocity Innovator Award for its creativity, leadership and best practices across its global digital marketing efforts. We are thrilled to receive the Cisco Marketing Velocity Innovator Award which reflects the top-performing marketing campaigns with Cisco and their partners as selected by a group of Cisco partner regional leaders and executives. We heard loud and clear at the Cisco Marketing Velocity 2017 in Chicago, that Cisco was moving to a digital-first strategy, and we wanted to be part of that marketing journey. The award culminates the efforts of Veeam and Cisco in developing a joint digital marketing platform shared by both companies to drive their joint online marketing efforts and lead customers through their buyer’s journey together. Veeam team receiving the Innovator Award at Cisco Marketing Velocity 2018 from Karen Walker, CMO of Cisco.